The NEW Jergens Lift-Check™ hoist ring assures that your application is secure and ready to lift. 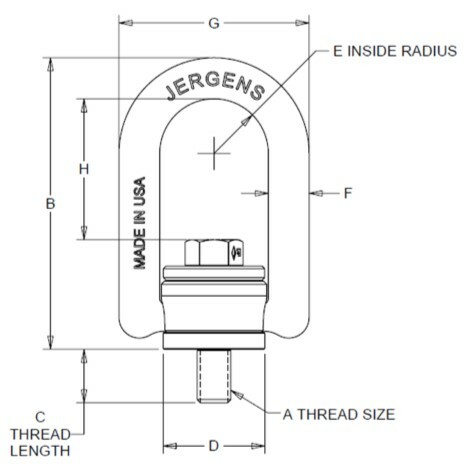 The Lift-Check™ is comprised of a Jergens’ patent pending proprietary hex head cap screw which integrates the Visual Tension Indicator. Patent pending Lift-Check™ Forged Style Hoist Rings are rated at 5:1 strength Factor & Proof tested to 200% of rated load capacity, certificate of proof test provided, in accordance with ASME B30.26. Visual Tension Indicator confirms engagement – clearly illustrates whether bolt joint is loose or tight. Lift-Check™ bolts are reusable and provide reliable visual indication of joint clamping force. Bolt kits available for Jergens hoist ring upgrades.